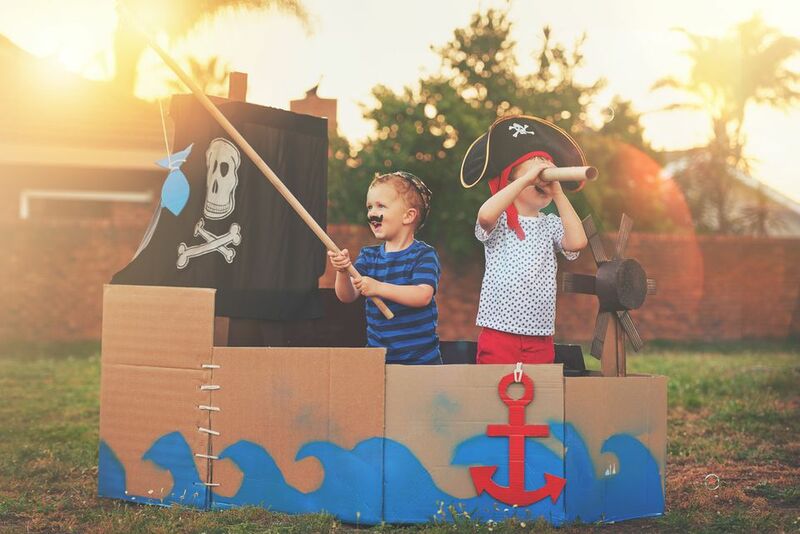 Ahoy Mateys - Plan a Pirate Party! Have you ever wished you could host a party that embodied the feelings of adventure and romance? Would your friends be willing to dress-up a bit and play act? Do you long for the day when boys could be boys and girls could be sassy? Then a pirate party may be the perfect event for you. Create invitations with this free, printable skull and crossbones invitation image on one side, and your party details on the other. Roll the invitations and tie with thin cord, then mail in a mailing tube. Start by decorating your home with a nautical motif. Fishing nets, crabs, lobsters, fish, and ships will all fit the mood. Hoist a Jolly Roger flag in a strategic place, such as your entryway or in the buffet area. If your guests are into dressing up, ask them to come to the party dressed as pirates or wenches. Costumes can be found in costume shops, especially at Halloween time. There are also web sites that sell pirate paraphernalia. If you choose not to ask your guests to dress up, give the men pirate bandanas and eye patches, and give lots of beaded jewelry, bandanas and bangle bracelets to the women when they arrive. Walk the Plank - Blindfold your guests and have them walk across a long 2 x 4 plank. The later in the evening you play this game, the funnier it should be, especially after a little Planters Punch. Give out prizes for the players who can walk the plank without falling off. Play Capture the Flag - Play this game using pirate flags, and paint over the picture with glow-in-the-dark paints. Playing in the dark will make it a lot more interesting for adults. Change the rules as you go along - you are pirates, after all! Give water guns to all players so that they can attack the opposing players as they try to take the flags. Organize a Treasure Hunt - Give all guests a series of clues that will lead to a supply of treasure maps. Make the treasure maps lead to the buried treasure which could be anything your budget allows, including gold-foil chocolate coins, bottles of rum, theater tickets, etc. Show Pirates on the Big Screen - In one of your party rooms play pirate movies, such as The Pirates of Penzance or Pirates of the Caribbean. Pirate cuisine generally fell into one of two categories - plentiful or starvation. While at sea for long periods of time, fresh food would be scarce. But once the ships docked in the Caribbean, then the pirates would have plenty of food on which to feast. For your theme party I recommend a combination of shipboard and island dishes. Salmagundi - This pirate stew, based on a British recipes, was essentially a conglomeration of whatever they had on hand. This Americanized version of the dish has the easiest ingredients to locate. Pirate Salmagundi might include turtle meat among other uncommon ingredients. Hardtack - This type of non-perishable biscuit was a staple aboard pirate ships. You can serve these with your Salmagundi, but they're not too exciting on their own. Codfish Fritters - Seafood would most certainly be part of a pirate's diet. Jerk Chicken - When pirates landed on an island in the Caribbean, the eating was good. Barbecue was a common method for preparing food. This recipe will give you one of the popular, although spicy, flavors from the islands. Puerto Rican Rice with Pigeon Peas - This is a very hearty side dish, and if you leave out the salt pork, it would serve as a main dish for any vegetarians at your party. Caribbean Banana Bread - This dessert bread incorporates many of the ingredients the pirates would enjoy on the islands such as sweet potatoes, coconut and bananas. Mango Coconut Balls - You could rename these little sweets "canon balls" to tie in with your party theme. Planters Punch - This punch will capture the spirit of pirate grog with the rum and citrus flavors, but a few other ingredients make it much more interesting than that. Fruit Punch - Here's a punch for your friends who don't indulge in alcohol. Sadly, they'll probably win all the prizes for walking the plank without falling.